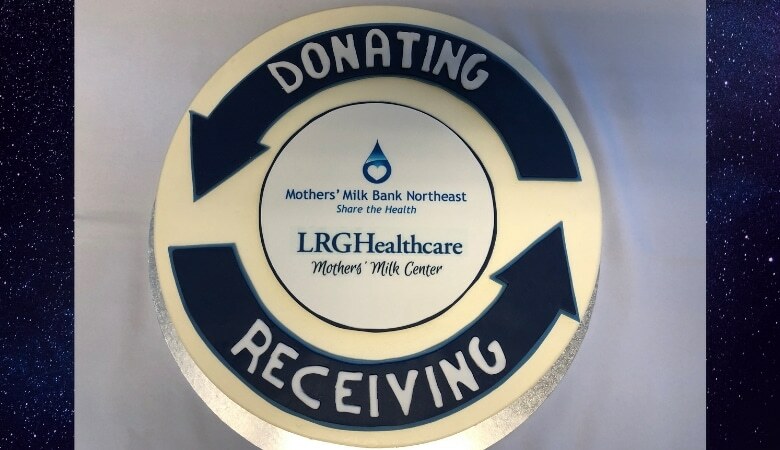 A beautiful cake with a circle of “Donating” and “Receiving” arrows conveyed the cycle of milk donation celebrated at the opening of a new milk depot at the LRGHealthcare Mothers’ Milk Center in Belmont, New Hampshire on March 6. This marks the first location to host both a dispensary and a depot for Mothers’ Milk Bank Northeast. Families who need milk for their babies can receive it at this community location, while mothers who have more than their babies need can bring in their milk for shipping to the milk bank, which screens, processes, and pasteurizes the milk before sending it out to hospitals, outpatients, and this dispensary. This spirit of giving, together with steadfast support from the entire staff at the pediatric practice, has been essential to the success of the dispensary, which has served over 50 families in its first three months. Medical Director Susan Coulter makes a strong case for bridge milk—the use of a small amount of donor milk to support breastfeeding if a mother is struggling in the early days. As Dr. Coulter explained at both dispensary and depot openings, mothers tend to view donor milk as a temporary support, and formula as a permanent solution. The more mothers and babies can breastfeed, the better for long-term and public health. Practice Manager Christine Farrell has worked diligently with Dr. Coulter and lactation consultant Quinlan to realize the vision of a breastfeeding center unique to New Hampshire and to the region. Read complete coverage of the depot opening in the Laconia Daily Sun, which also covered the dispensary opening in December. The LRGHealthcare Mothers’ Milk Center is located at Belmont Medical Center, 8 Corporate Drive, Belmont, NH. The practice is open Monday through Friday 8 am to 5 pm. Milk donors screened by Mothers’ Milk Bank Northeast can call 603-528-0995 to schedule a time to drop off milk. Appointments are also recommended for families who wish to receive milk; read more on our Donor Milk Dispensaries page. Screening for milk donation is an easy four-step process. Check out the basic requirements and get started today!